A review of recent pan-European developments in the criminalisation of solidarity. New developments are emerging in the criminalisation of solidarity, as the hostile environment principle, familiar to us in the UK, is adapted to other European contexts, further shrinking the space for solidarity. 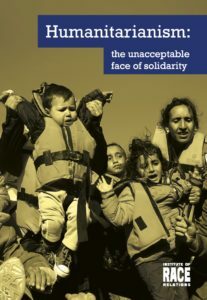 The IRR’s report Humanitarianism: the unacceptable face of solidarity, in which we called on EU member states to stop using immigration and anti-smuggling laws to criminalise humanitarian actors, was published towards the end of last year. But since our research was published, there have been a number of alarming developments, none of which has gone unchallenged. In the first known case involving cooperation between the Spanish and Moroccan authorities, the Spanish police, having failed to mount a case against Helena Maleno, a prominent Spanish humanitarian, for human trafficking, have encouraged the Moroccan authorities to launch a criminal investigation instead. The Hungarian government, for its part, has further sought to use the law to isolate and stigmatise refugee and migrant NGOs, publishing proposals to tax NGOs which help migrants, using the proceeds of those taxes for border policing, and to issue banning orders to keep migrant helpers and their supporters away from borders. The French president, visiting Calais, has mixed verbal denuniciation with new legal measures. While Macron followed the lead of Calais’ mayor in smearing migrant support groups, his interior minister announced proposals to conduct immigration checks in emergency accommodation and homeless hostels. And in the UK, trenchant criticisms of ‘hostile environment’ measures in housing, employment, healthcare, driving licenses and banking – by landlords, government committees, the independent inspector, MPs and rights groups – have not prevented its further extension, in criminal law and in banking, with the apparent aim of integrating every area of life into a seamless web of immigration enforcement. On 9 January, migrant organisations filled the cathedral in Tangier in an act of solidarity with Helena Maleno Garzón, who was appearing before an investigating judge the following day. A migrants’ rights activist and spokeswoman for the NGO Caminando Fronteras, based in Tangier, Maleno is under investigation for ‘aiding and abetting illegal immigration’ for her work alerting the Spanish coastguard about migrant boats in difficulty crossing the Strait of Gibraltar to Spain. For many years, migrants in distress have been calling Maleno, who passes information on to Spanish Maritime Rescue, which works under the Spanish Industry Ministry, or to the Moroccan authorities. Captain Miguel Zea, chief of the Maritime Rescue centre in the Spanish coastal city of Almería, says, ‘I am not exaggerating when I say that she is probably the person who has saved most lives in the Strait – at least 10,000’. She has also been a fierce critic of so-called ‘hot returns’ – migrants sent back from Spanish enclaves Ceuta and Melilla to Morocco without allowing them to make asylum claims. Maleno’s work was recognised in 2015 by a human rights award from the General Council of Spanish Law. But according to Caminando Fronteras, the criminal inquiry comes after ‘attacks, aggression and threats’ against her. A Spanish judicial investigation of Maleno’s work was discontinued in April 2017 for lack of evidence of crime, according to radio channel Cadena Ser. Now the same police file, describing her as ‘an important international smuggler of migrants’, has found its way to Morocco. She described the dossier as ‘terrible and horrifying’. 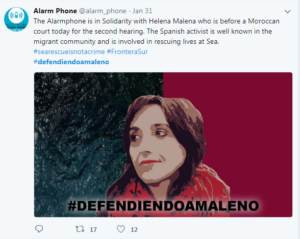 Her lawyer, Francesc Mateu, was also horrified, at the attempt to portray Maleno as a trafficker, and at the use of Spanish police evidence already rejected by a Spanish judge. He told IRR News that he sees the investigation as a result of tension between the different police forces in Spain, with the Guardia Civil responsible for borders and the Policia Nacional for investigating smuggling and trafficking. At the 10 January hearing, the investigating judge acknowledged Maleno’s humanitarian motive and asked to see the Spanish judicial file. The prosecutor did not produce it, either then or at the adjourned hearing on 31 January, although Maleno provided an unofficial Arabic translation. She is now waiting to find out whether she will face charges for which the penalty is many years’ imprisonment. A solidarity campaign on Twitter with the hashtag #DefendiendoAMaleno has gathered many supporters, including actor Javier Bardem. Journalists, professors, actors, film directors and others, along with over 350 civil society organisations, have signed a petition in her support. Organisations that ‘propagate and support mass migration’ or ‘sponsor or otherwise support’ persons illegally crossing the border will be required to register with a court, and to declare publicly any support received from abroad. Such organisations will be taxed at the rate of 25 per cent of all income from abroad, and the tax will go towards border security. Failure to pay the tax will incur a fine of double the amount owed. Any person assisting migrants to enter or reside in Hungary unlawfully, or who supports a migrant support organisation financially, may be subject to a restraining order banning him or her from an 8km area by the EU / Schengen external border. Non-EU nationals in this category may be banned from the whole of Hungary. Victor Orbán’s Fidesz government has consistently stoked anti-migrant and anti-Muslim hatred, refusing to take its quota of refugees from Greek and Italian hotspots under the EU’s mandatory refugee relocation scheme, and dehumanising those seeking asylum or security by calling them ‘illegal border crossers’ and ‘Muslim invaders’. One of the first to erect fences and walls to keep out the refugees in September 2015, it passed laws criminalising unauthorised border crossing and routinely detains asylum seekers. It is now extending the stigmatisation and the penal policies to humanitarian and rights groups that work with them. It is not the first time Fidesz has tried to smear tactics against solidarity groups: in August 2017, the party lost a libel action brought by the Hungarian Helsinki Committee (HHC) for claiming that the organisation defends people who commit illegal acts. The party was ordered to issue a public apology and to pay HHC a million Hungarian forints (about £2,700) in damages, and to desist from distributing material making such claims. Despite the order, HHC was one of three organisations named by a Fidesz MP on 20 January as NGOs that ‘support or organise illegal migration’. In October, a month after the European Court of Justice rejected Hungary’s legal challenge to the EU’s mandatory refugee relocation scheme, Orbán called on spy agencies to investigate a ‘Soros empire’ of groups and individuals that were seeking to have Hungary ‘condemned, stigmatised and forced to change its migration policy’. Orbán has run a huge and expensive media and billboard campaign against Soros, employing anti-Semitic tropes condemned by Hungary’s largest Jewish organisation, Mazsihisz as harming the whole country with its ‘poisonous messages’. And the poison is spreading: Freedom and Direct Democracy, an anti-immigrant party in the Czech Republic allied to president Milos Zeman, says it will adopt the campaign against Soros-funded NGOs, whose goal, according to party leader Tomio Okamura, is ‘to destroy national identity and natural cultural and social values’. The Hungarian ‘Stop Soros’ package seeks to paint Soros-funded civil society groups as unpatriotic and traitorous for their support for migrants. In the words of Miklós Haraszti, the wider aim of the package is for ‘the government to be identified with the nation, and [to] squeeze out independent activism as alien and even hostile to the nation’. Thus, it goes beyond stigmatisation into outright criminalisation. It attempts to curtail the NGOs’ freedom of movement through banning orders, and to tax them for solidarity work as if they are bringing toxic waste into the country. Suspicion of solidarity with migrants on the part of MPs is now seen as an offence justifying exclusion from parliamentary committees. In January, the Fidesz deputy chair of parliament’s national security committee attempted to exclude Green Liberal co-chair Bernadett Szél from the committee, of which she is a member, because of a tenuous link with a Soros-funded group and her researcher’s links with migrant rights group Migszol. But the NGOs continue to fight back. The HHC is among fourteen NGOs which have taken the government to the European Court of Human Rights over a law of June 2017 which required organisations receiving funding from abroad to register with the authorities, with fines and criminal sanctions for non-compliance (the Law on the transparency of organizations funded from abroad). On 15 January, before the visit of French president Emmanuel Macron to Calais, mayor Natacha Bouchart was attempting to blame civil society groups for the continuing presence of refugees and migrants there. In a TV interview, she claimed that organisations working with migrants there had no real interest in ensuring their comfort and safety elsewhere as they ‘depended on the migrants for their existence’. Migrant support groups responded that she had inverted the reality: they were there because of the shameful failure of the authorities to make any provision for the migrants, who were forced to rely on the volunteers for their existence. 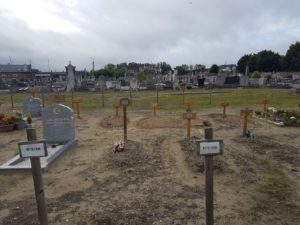 Bouchart’s attempts to criminalise groups distributing food and clean water to migrants by making unauthorised assistance illegal had been rejected in June 2017 by the Lille Administrative Court, which ordered her to provide sanitary facilities in the town. Macron himself, in his Calais speech the following day, accused unnamed NGOs of ‘lies and manipulations’. When they ‘encourage these women and men to stay [in Calais], to settle illegally, or even to be smuggled across the border, they take on immense responsibility. Never, never, will they have the State at their side’, he said. To an audience of police and gendarmes, he also condemned NGOs who encouraged claims of police brutality, saying that those fabricating claims would be brought to court and punished for defamation. But since the French government itself had only months earlier condemned police behaviour in Calais, after commissioning an independent inquiry which found abuses including routine use of chemical spray on children, Macron was forced to demand ‘exemplary’ behaviour, professional ethics and absolute respect for the law from police. They must, he said, treat the migrants as human beings, not waking people in the middle of the night, and not using teargas ‘at mealtimes’. On 18 December 2017, International Migrants’ Day, a coalition of homelessness charities, housing and migrant rights organisations called on the French Ombudsman to intervene to stop the immigration checks by mobile teams of prefects and immigration officials in homeless hostels proposed by interior minister Gérard Colomb on 8 December. The organisations say the proposal, which would require hostel managers to pass on to officials information obtained from guests, breaches confidentiality rights, extends immigration controls to private spaces, and ‘diverts the emergency shelter and the reception centers from their purpose, using them to implement a policy of migration management’. They fear that the checks will deter migrants from using emergency accommodation and force them onto the streets. In fact, the hostile environment principle is one most normally associated with the UK, where it has been an openly-stated aspect of British immigration policy since at least 2013. A Home Affairs Committee report on immigration policy, published in January, featured severe criticism of the government’s hostile environment measures from the independent inspector of borders and immigration (ICIBI) David Bolt, who pointed out that the Home Office had no way of measuring the effectiveness of the policies limiting access to work, housing, healthcare, bank accounts and driving licences, and restricting rights of appeal against Home Office decisions. He said Home Office officials failed to understand the often traumatic effects of the policies, particularly for the many wrongly deemed ‘illegal’. Some employers reportedly restrict vacancies to British passport-holders, while banks and building societies are reluctant to open accounts for refugees with legal status. Reviewing this evidence, the committee concluded that the policy was unclear and open to errors which ‘could be deeply damaging and distressing to those involved—as with letters being sent to EU nationals about their right to live in the UK—[and] also undermine the credibility of the system’. Later in January, the chair of the House of Commons Select Committee on Health wrote to the chief executive of NHS Digital requesting the body’s immediate withdrawal from a memorandum of understanding with the Home Office that allows for the sharing of patients’ addresses for immigration tracing purposes. Select Committee chair Dr Sarah Wollaston said there had been ‘a failure to appreciate the wider implications of their actions for the individuals concerned, for clinicians, and for wider public health’. The letter accused NHS Digital of not consulting organisations such as the National Aids Trust and Doctors of the World, ignoring the concerns of the General Medical Council (GMC) and the National Data Guardian (NDG), riding roughshod over obligations of patient confidentiality and ignoring public health concerns expressed by Public Health England. The Residential Landlords Association (RLA) is another body that has voiced serious concerns about the hostile environment, this time in housing. Under the ‘right to rent’ policy landlords are required to check the immigration status of all occupants, and can be prosecuted if they know or ‘have reasonable cause to believe’ that a tenant, sub-tenant or other occupier has no permission to be in the UK. A survey of 2,800 landlords conducted by the RLA in December 2017 revealed that over forty per cent of landlords were less likely to rent a room to someone without a British passport, for fear of criminal sanctions. The organisation called on the Home Office to suspend the scheme ‘pending a full and detailed assessment of its impact on tenants and prospective tenants’. And from January, banks and building societies have been required to conduct quarterly checks on the immigration status of holders of all their current accounts (estimated at 70 million) and must notify the Home Office of any account holder who appears to be in the UK without leave. The Home Office can instruct the bank to freeze or close the account of a ‘disqualified person’. They were previously required to check the immigration status of those seeking to open a current account, and those current account holders notified to them by the Home Office as ‘disqualified persons’. But in an ICIBI inspection quoted by the Home Affairs Committee, ten per cent of ‘disqualified persons’ were wrongly included on the list provided to the banks by the Home Office. Over sixty MPs and rights groups wrote to the home secretary in December urging her to stop the ‘inhumane’ policy. ‘There is no evidence to suggest that [the measures] will achieve the stated aim of encouraging people without regular migration status to leave the country, and good grounds to believe they will have a number of other damaging consequences’, the open letter warned – but to no avail. The raison d’être of the ‘hostile environment’ is an attack on the presence of unwanted people, an attempt to police migrants out of existence. As such, it is anti-human in conception and execution. And the criminalisation of humanitarian actors through the use of immigration and anti-smuggling laws is a particularly pernicious aspect of the hostile environment, as it seeks to deter people from acting on their better and kinder instincts. When it comes to the criminalising of solidarity, what is needed is for the European Commission to set a clear lead. For a start, it should review the 2002 Facilitators Package legislation which required member states to criminalise human smuggling. The law gave EU member states the option of exempting humanitarian actions, but did not make the humanitarian exemption mandatory, and the Commission, which reviewed the law in March 2017, decided there was no need to create a mandatory ‘humanitarian exemption’. What the latest developments in Spain and Morocco, Hungary, France and the UK demonstrate is that the criminalisation of solidarity is not just about the prosecution of individual actors – it is about creating a rigid and unbending popular culture where NGOs are isolated, individuals stigmatised and legal and political challenges against laws denying asylum seekers and migrants their rights are discouraged. It was back in November 2017 that the IRR published its research, Humanitarianism: the unacceptable face of solidarity. At that time, we sent a copy the European Commission, asking them in a covering letter to reconsider the decision they made in March 2007. Two months later, at the end of January, the Commission finally replied. Their response (read it here) does not address the cases we presented, but argues that it is for member states to decide whether conduct is criminal or not. This entirely misses the point: a mandatory humanitarian exemption would not only set clear limits on states’ ability to criminalise acts such as rescue assistance if a humanitarian motive was established. It would also – and this perhaps explains the Commission’s reluctance – send a clear signal to states that there are limits to an anti-humanitarian political culture that, in abandoning refugees, criminalises humanity. See ‘Manifiesto en apoyo de Helena Maleno Garzón’, Caminando Fronteras, 25 December 2017. 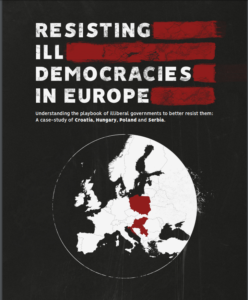 See ‘Countering illiberal usurpations of democracy’, Foreword to Resisting Ill democracies in Europe, available to download at Human Rights House. The quote refers to government actions in all ‘illiberal democracies, taking Poland, Croatia, Serbia and Hungary as case studies. See a detailed account of attacks on Hungarian NGOs by the government here. See ‘Countering illiberal usurpations of democracy’, Foreword to Resisting Ill democracies in Europe, available to download at Human Rights House. The quote refers to government actions in all ‘illiberal democracies, taking Poland, Croatia, Serbia and Hungary as case studies. See ‘Who poses a danger to Hungary’s national security? Anyone who lends a helping hand to a refugee’, Hungarian Spectrum, 20 January 2018.